I found [Windstorm] element that make an explosion after enemy officer is defeated and it is not affected by the [max elements] cheat. I suppose there are even more of them. I would really appreciate it if someone could make an "Unlock All Characters" cheat, or let us unlock individual characters at will. The co-op Story is super wonky and only gives char unlocks to the host, and not the person joining. Loot and XP is shared however. If someone could make this so I could do co-op without having to replay each mission twice, that'd be amazing! If you go into the Weapon Fusion screen like I described before, the Element Inscription storage amounts are stored just above your Weapon Fusion code. I'll post a pic here with the relative addresses. 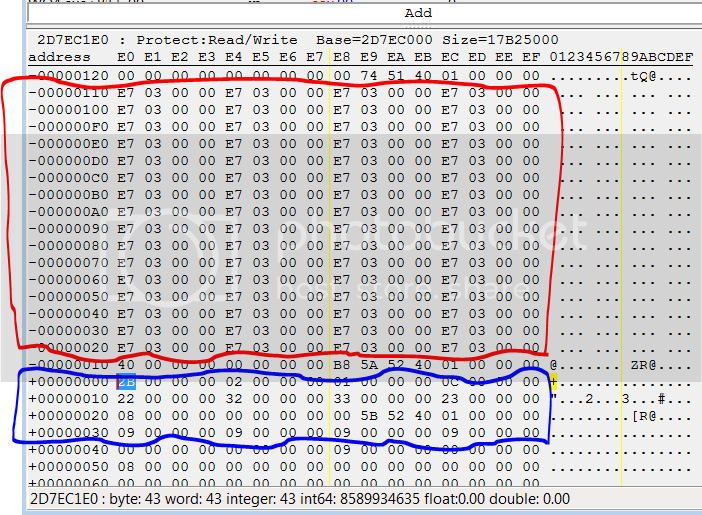 Your Blue section is the Weapon Fusion code I've already outlined. The red section is the Element Storage. Values are 03e7 across the board. In case it confuses you, if you're Weapon Fusion code starts at 2D7EC1E0, then the Element Storage will start at 2D7EC0D0 and end at 2D7EC1CF. The very last Element should be Unity btw. I wish we can choose Pandemonium Difficulty any time, at any mission. Had some PMs about this. If I'm gonna explain it again to one person, might as well post it here. Shouldn't hurt since there isn't a table that includes this option. Anyway, here it is. First thing you need is your OWN weapon code. Go to the game, and go to Weapon Fusion and select a weapon. You Have to be be in the Weapon Fusion menu and have a weapon selected for any of this to work. After you have selected to weapon, look at the elements you have on the weapon. The elements are ordered left to right, top to bottom. I posted a list of each weapon element code already, but here it is again. Now, make sure the game is in the Fusion Menu. You should see all your Element stock listed to the left. 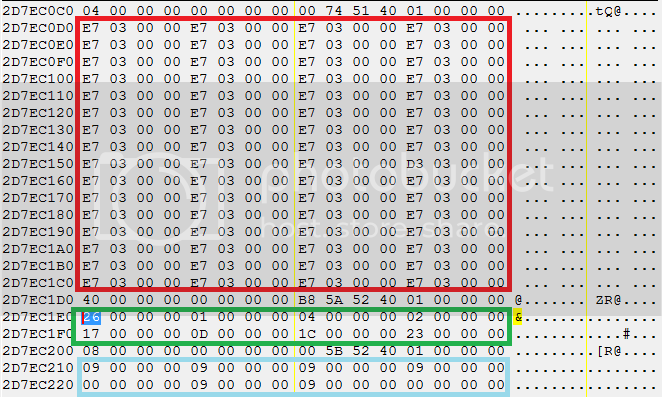 Open Cheat Engine, and select WO4.exe process. Then click "Memory View" button. A new window will pop up. Click "Search" at the top menu, then "Find Memory". A small box will pop up. Select the "Array of Byte" bubble and make sure "From" box has zero in it. Then paste your code into the text box at the bottom. Hit enter and you should be taken straight to your weapon code. You should see something like this. Now the green box is your Element Inscription. The blue box is the Element amount. And the red box is your Element stock. Change values to your heart's content. You can modify the value in any of these boxes. You can modify the currently selected weapon OR the Element stock. Then go back to the game and go back one screen and you should see your changes implemented. The trick to all of this is, YOU MUST BE IN THE WEAPON FUSION SCREEN. The one where you see your Element stock to the left. Without the weapon fusion screen, this whole area is completely different. Now, one thing about the Element Stock. This is definitely where you modify the quantity of Element Stock. BUT, you may have to already have at least ONE of the Element for it to show up. IF this is the case, simply modify the weapon and put whatever elements on it you wish. The dismantle it in game to get some quantity to start. Then get back to this space and modify your quantity. Anyway, this is the best I can do in explaining it. There's really nothing else I can add. Good Luck. Any chance we can get a speed modifier for horses? A run speed mod usually needs constant hotkeying because of control issues, but with a horse you can control that much better. Horses can go everywhere now, unlike SW4. i found it as well but what does it do? what do you mean by player scale? If anybody wants to try these pointers, they should let you edit some stuff for the first weapon slot for every character. It literally change your scale, but there's like one value (64 00) that change your size constantly and another one who change your size temporary. Anything below 64 will make you shrink, you have to change the 00 after the both 64 to make it even bigger (of course you can change the 64 to change the scale too). I wanted a camera mod (or even a zoom out mod) to see what I'm doing. This should help with weapon editing. I'm noob at cheating so I don't know if this is good enough but I've tried it a few times and it works. You guys can try this out and please don't mind my noobility. Also regards to the one that figured the weapon editing out.